Belt sanders aren't used all that often in fine woodworking. Most of the time, when building a piece of furniture or similar project, other tools are used to fashion a part of the project in a rather precise manner. A belt sander's forte is taking off considerable amounts of stock from the face of a piece of wood quickly. That being said, there is still a place for a belt sander in every woodworker's shop. They just may not need to use it all that often. For instance, a belt sander is great for forming curved shapes on small pieces of stock, by clamping the sander upside-down and using it as a stationary sander. It is also great for correcting problems, like a misaligned joint on a glued-up table top. They're commonly used for taking the top layer off of an old wooden floor, particularly where the joints in the wood may be creating some uneven ridges on the old floor. Be advised, however, that holding a belt sander in one place can easily make a problem worse. In any event, a belt sander should be considered the first step in smoothing a surface. You'll need to follow-up with a palm sander or random orbital sander to smooth out the surface (and remove the grooves created by the belt sander) before finishing. When using a belt sander by hand to begin to smooth a surface, first, make sure that your clothing is completely out of the way. Belt sanders have a substantial amount of torque, so loose-fitting clothing should be kept well clear of the sander. Begin by turning on the sander and allowing the motor to get up to full speed. Then, using two hands (one on the trigger handle and the other on the forward handle for stability), ease the sander down with a slight forward motion. The rear roller should contact the wood first, then set the rest of the sanding face down onto the wood. The belt will tend to grab the wood and drive the sander forward, so you'll need to hang on rather tightly. Work the sander with the grain of the wood as much as possible, and do not allow it to stay in one place. A belt sander, particularly one with a very coarse belt, can tear through a surprising amount of stock very quickly, so keep the sander moving. Stop and check the progress frequently. When using a belt sander, it is much better to work in small increments using light pressure on the sander than to push down and really tear through the wood, only to leave an indentation that needs to be repaired later. Another popular use of a belt sander is to clamp the sander upside down on a work table, then use it as a stationary sander. This works great for sanding smaller pieces or for forming shapes on the edges of wood, although it is a rather imprecise method for doing so. 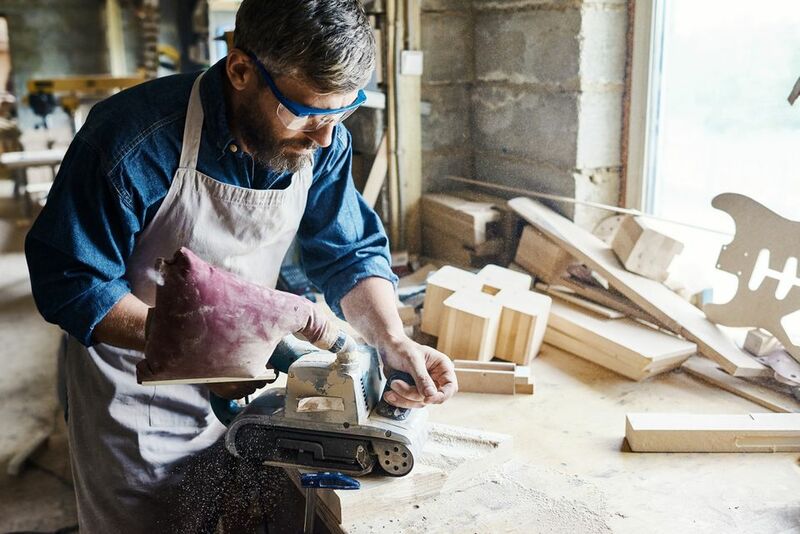 Simply clamp the belt sander to the table, lock the trigger into the "on" position, and hold your piece of wood against the spinning belt to form the desired shape. Note: A stationary belt sander can even be used as a rough tool sharpener for grinding the face of chisels, plane irons, and gouges. When changing the belt on a belt sander, always disconnect the power cord before starting. Typically, a belt sander will have a release lever on one side that will release the tension between the front and back roller. Once the tension is released, slide the sanding belt off of the rollers. To apply a new belt, center a new belt onto the rollers, release the lever, plug in the sander and away you go! Point of interest: Here's a really neat article on how sanding belts are made. The process is really quite fascinating. When buying a belt sander, we'd look for three primary features. First, we'd want one with a variable speed motor, that allows controlling how fast the sanding belt will rotate. Second, the sander should be solidly built. It should feel rather heavy in hand, so the weight of the sander will do most of the work, keeping you from having to push downward with excessive force to get the sander to remove material. And third, the sander should be equipped with a dust bag (whose port can optionally be connected to a dust collection system), as a belt sander will make a lot of sawdust.